Who will protect American interests from 'America first' doctrine? 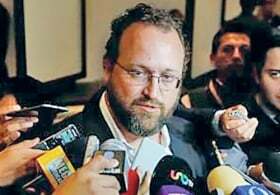 Flavio Volpe is president of Canada's Automotive Parts Manufacturers' Association. In a July interview with a respected business daily about then-upcoming North American Free Trade Agreement talks, I was asked about whether the auto industry had reason to worry about the protectionist rhetoric in Washington. Convinced that all three countries understood how interwoven the North American industry was, I said, "Americans do well to have Mexican and Canadian supply when we compete" against other major auto jurisdictions around the world, such as Germany and Japan. Perhaps prematurely, I added that I was not "concerned that anybody is going to shoot themselves in the foot" regarding the automotive sector. It appears I was wrong. 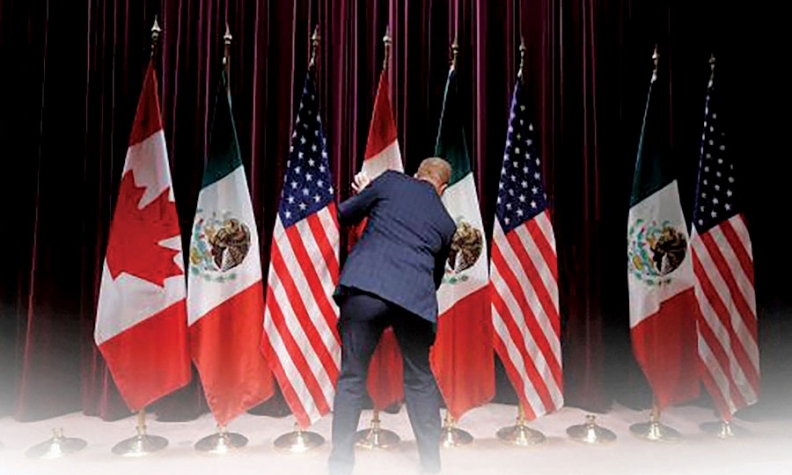 A staff member moves flags at the close of the third round of NAFTA talks. In the fourth round of the NAFTA negotiations this month in Washington, the United States proposed new automotive rules of origin. A proposed new 85 per cent regional content requirement to avoid duties (up from an already highest-in-the-world NAFTA level of 62.5 per cent) together with a 50 per cent U.S. content requirement for goods built only in Canada and Mexico got the most attention. New proposals that include tracing the origin of all raw materials to their primary source to verify their country of origin, presumably including granules of sand for glass production, and the elimination of tariff shifting were just as difficult to anticipate. With a two-year timeline to enforcement, many observers gauged the U.S. position as an invitation to Canada and Mexico to leave the table rather than as a serious opening commercial position. How do you have protectionism in a free-trade agreement? The career negotiators at the Office of the U.S. Trade Representative presumably know this is an oxymoron. Less than two years ago, during the Trans-Pacific Partnership negotiations, they proposed a significant lowering of regional content to 45 per cent on vehicles and allowed for those cars to be made in nine new countries and still meet the threshold to be sold tariff-free into the United States. This incredible paradox must mean that U.S. negotiators are getting their orders straight from the White House. "America first" is the core doctrine and "bring back our jobs" is the second, damn the torpedoes. Do the new proposals really put America "first"? In targeting Canada's and Mexico's assembly sector with a 50 per cent U.S. content demand, the proposal hurts U.S. automakers operating in those countries directly. Domestically, it may be worse. Content levels only matter if your product crosses a border to reach a customer. Without an incentive to consider all three NAFTA markets in their production plans, U.S.-based assembly could plan for a car to not have to cross a border. The United States. already buys five million more cars than it manufactures annually. A U.S. vehicle assembly plant geared strictly to domestic consumers could allow for sourcing cheaper auto parts from anywhere in the world without regional or domestic content requirements. The big loser here might just be the U.S.-based auto parts manufacturing sector and hundreds of thousands of American workers in towns such as Northwood, Ohio; Springfield, Tenn.; and Bowling Green, Ky.
American protectionism that leaves U.S .companies unprotected in Canada and Mexico while also incentivizing parts sourcing from China, Eastern Europe, Vietnam and Malaysia for U.S.-based auto assembly isn't protectionism at all. It's untested political ideology that damages U.S. interests in an effort to punish others for the natural effects of globalization and automation. While the United States picks a fight with its best friends, it has proposed new rules that could attract foreign interests to enter the United States with minimal assembly investment, committed to bringing in cheaper parts from their price-competitive home bases. That will hurt U.S. interests. Sometimes it takes an intervention of sorts to remind people who their friends really are. Friends don't let friends harm themselves. Perhaps we could have been there more often when you felt you weren't getting a fair share, to show our concern and commitment. But we are here now and you've made a hole in your foot — let's help mend it together. We continue to have hope for NAFTA, but we have to start looking out for each other too. The wolves are circling.